Book a team building activity with Outdoor Adventure! Here at Outdoor Adventure, we don’t think the importance of team-building can be overstated. Residential school trips, youth groups, corporates, stag and hen do’s, sports and social clubs or whatever the circumstance, any group of people who spend time together could benefit from one of our group activity days, which includes a team-building exercise. We’ve created a list of the reasons you should consider team-building for your business and how it could have a vast amount of positive results for your work place. It doesn’t take a genius to realise that a friendly work environment will increase productivity and morale within employees tenfold. Socialising and making friends with the people you work with is essential to allow for group projects to flourish, as well as contribute to problem-solving capabilities as an organisation. Embarking upon a team-building activity together allows the staff to better understand each other’s strengths and weaknesses, once again contributing to how well they can and will work together. Communication is key both in the team-building task and for future progress of the company, this activity will put existing skills to the test, while developing new ones along the way. A little bit of competitiveness within work situations has shown to increase production. The activities offered at Outdoor Adventure provide the perfect opportunity for some friendly office banter, because most of the participants will be in the same boat as a beginner at the activity. This level playing field allows the least likely people to flourish, and some may even discover a hidden talent they can pursue in their own leisure time, creating a healthy work/leisure balance. Groups who embark upon our group activity days find themselves working together to achieve a common goal. Once completed, this feeling of elation encourages them to want to reach their targets even more, which can then be reflected in the work environment. Cheering each other on, being enthusiastic and celebrating together are all positive ways to motivate employees whilst offering support when needed. A lot of the time, our team building activity requires participants to think outside the box in order to complete the challenge. Forcing them to get creative together in an unusual context could be mirrored at collaborative meetings where new and original ideas are required. Our group activity days provide plenty of opportunities for the group to communicate with each other whether that be problem solving in a team-building exercise, offering tips and guidance or simply having a general chit chat between activities. Every work place strives to be an environment where people are comfortable and are willing to talk to everyone, making any collaborative tasks a whole lot easier. These skills are focussed on businesses taking part in a group activity day, but most of the advantages are transferable skills you can apply to any group context, be it large or small. 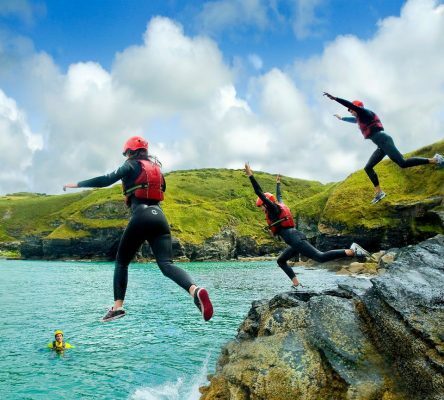 At Outdoor Adventure, there is a 35-year track record of delivering high quality customised activity days for groups and your experience can be tailored in whichever way you see fit. Book your business in for a group activity day today, and we’re sure you’ll soon see an improvement in the office!